From 1909 to 1948 Perkasie Mennonite functioned as a daughter organization of Blooming Glen Mennonite Church. Its primary focus was the afternoon Sunday school that had an average attendance of 130 during its early years. Preaching was held on Sunday evenings once a month. In 1914 it became the first congregation in the Franconia Conference to hold Sunday evening [[Young People's Bible Meeting|Young People’s Bible Meetings]]. This feature had wide support from youth and adults in surrounding churches. So many attended that the program was given twice in the same evening and an extra trolley car was necessary for the occasion. These meetings became a training ground, providing opportunities for leading singing, moderating the meeting, and giving talks. Small music groups that were banned in other congregations were an integral part of the evening programs. An important feature of these events was the initiative taken by lay persons. Offerings taken provided support for missionary [[Lapp, George Jay (1879-1951)|George Lapp]] in [[India|India]] and the Aaron King family in [[Cuba|Cuba]] as well as other relief projects. In early 1948 Franconia Conference gave approval for Perkasie Mennonite to function as an autonomous congregation. Richard C. Detweiler of [[Souderton (Montgomery County, Pennsylvania, USA)|Souderton]], who was attending [[Eastern Mennonite University (Harrisonburg, Virginia, USA)|Eastern Mennonite College]], was ordained for pastoral leadership. In August of the same year the congregation held its first annual [[Summer Bible School|Summer Bible School]] with an enrollment of 125. In early 1948 Franconia Conference gave approval for Perkasie Mennonite to function as an autonomous congregation. [[Detweiler, Richard Clemmer (1924-1991)|Richard C. Detweiler]] of [[Souderton (Montgomery County, Pennsylvania, USA)|Souderton]], who was attending [[Eastern Mennonite University (Harrisonburg, Virginia, USA)|Eastern Mennonite College]], was ordained for pastoral leadership. In August of the same year the congregation held its first annual [[Summer Bible School|Summer Bible School]] with an enrollment of 125. During the 1960s, 1970s and 1980s, Perkasie Mennonite experienced its greatest numerical growth. With a motto, "Every Member a Minister," there was a high level of lay participation in discerning and leading the congregational program of worship, spiritual growth and community witness. In 1956 an adjacent factory building was purchased and eventually renovated to provide a library, kitchen, fellowship hall, pastor’s office, and Sunday school classrooms. During this time a constitution and membership covenant were adopted, an annual congregational retreat initiated, a newsletter called <em>The Stepping Stones</em> published, and the use of nominations and balloting for filling leadership roles was replaced by a procedure of discernment by consensus. Kauffman, S. Duane. 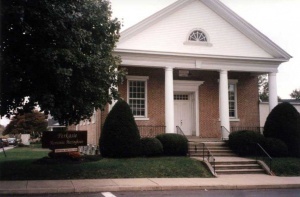 "Perkasie Mennonite Church (Perkasie, Pennsylvania, USA)." Global Anabaptist Mennonite Encyclopedia Online. January 2010. Web. 25 Apr 2019. http://gameo.org/index.php?title=Perkasie_Mennonite_Church_(Perkasie,_Pennsylvania,_USA)&oldid=135953. Kauffman, S. Duane. (January 2010). Perkasie Mennonite Church (Perkasie, Pennsylvania, USA). Global Anabaptist Mennonite Encyclopedia Online. Retrieved 25 April 2019, from http://gameo.org/index.php?title=Perkasie_Mennonite_Church_(Perkasie,_Pennsylvania,_USA)&oldid=135953.